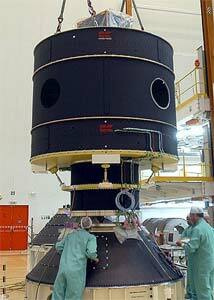 The 3.5 t payload MAQSAT-B2 (Maquette Satellite - Bas 2) was designed to represent a commercial passenger, but also served as technology platform for several European experiments. MaqSat B2 carried Sloshsat-FLEVO (a Dutch micro-satellite researching on fluid behavior inside a tank), Boucle-Fluide (a French heat pipe experiment), DVCAM (a French autonomous camera system monitoring key events of the launch) and a Telemetry Assembly (TMA). Development and manufacturing of TMA were also part of Kayser-Threde's responsibilities. TMA acquires environmental data of approximately 60 sensors on Ariane-5ECA, on MAQSAT and in Boucle-Fluide, and transmits it online to Ariane ground stations for a period of 3½ hours after lift-off.